Here’s where to find the two cheesemakers in Northern Ontario. Click on “View Larger Map” for a legend showing the two cheesemakers, Thunder Oak Cheese Farm and Thornloe Cheese. Our mission at CheeseLover.ca is to publish profiles of all cheesemakers, descriptions of cheeses produced and maps of all regions in a printed booklet and interactive website under the banner of Cheese Lover’s Guide to Ontario. More, as the Ontario Cheese Trail project proceeds. By the way, when you visit a cheesemaker, in Ontario or elsewhere, share your experience by leaving a comment below. Aging my wheel of Bonnie & Floyd at home hasn't been without trials and tribulations. I’ve been mothering a wheel of Bonnie & Floyd for three months now, and I can tell you that aging cheese properly during a Canadian winter isn’t easy, especially when one lives in a high-rise apartment building. 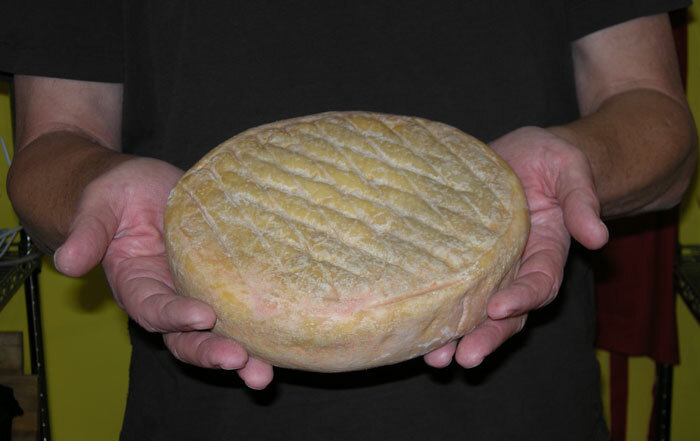 I received the wheel of my favorite Ontario sheep’s-milk cheese at the conclusion of a Cheesemaker for a Day program at Fifth Town Artisan Cheese in Prince Edward County in late November. Instructions from the caveman at Fifth Town, affineur Phil Collman, were simple: Age the cheese at a temperature of 12 to 15 degrees Celsius, with humidity between 80 and 90 percent, and wash it weekly with a mild brine. Easier said than done in an apartment building when outside temps drop to below -10 for weeks on end. Every corner of our apartment is of course too warm. Even our storage cage in the basement is too warm. And every corner of the underground garage is freezing or close to it. I finally found an unused, cluttered utility room where the temps at least were in the 5 to 10-degree range. 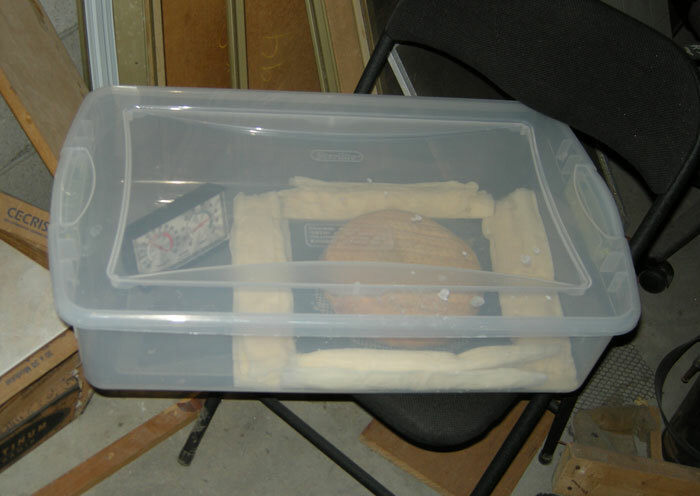 By storing the cheese in a large plastic container with wet paper towels I could maintain the humidity at close to ideal, but there was little I could do about the cold. I’ve been able to average only 8.3 degrees over the 13 weeks so far. In the purpose-built cave at Fifth Town, Phil Collman ages Bonnie & Floyd for three months. When I informed him of the conditions here, Phil suggested I take four months, noting that the humidity was more important than the temperature. So, I’ve been visiting the cheese twice a week to keep the paper towels wet—and the humidity holding at 80 percent. Four months passed a few days ago since the wheel was made. I’m giving the cheese another two weeks until a special gathering of our extended family. I’ll be on tenterhooks when the tasting begins. Sweet goat-cheese mousse: What a concept! Spectacular fireworks open Winterlude in Ottawa. Photo by Dennis Catangay. Kicking back in Zoe’s Lounge at the Fairmont Chateau Laurier in Ottawa is a fine way to conclude a road trip that started 10 hours earlier. We have a window table under the atrium with a view of the stately National Arts Centre and Wellington Street where pedestrians in parkas and toques scurry back and forth. As we had a productive meeting earlier in Picton to discuss the Ontario cheese trail concept, I’d like to end the day on a cheese high. I order a French onion soup, make a “Canadian cheese board” my main, and finish the meal with what turns out to be an exceptional apple cake. The Canadian cheese plate is fine in an ordinary sort of way: Oka is always nice, three-year Balderson Heritage Cheddar has bite, Ermite from Abbaye de Saint-Benoit-du-Lac has blue tang and a linger of mushrooms, while the Chevalier Triple Cream Brie is suitably creamy. On the side there is a tasty mission-fig chutney and a perfect cluster of small grapes. But the piece de resistance is the apple cake, more specifically, brown butter apple cake served with roasted walnut vanilla ice cream, marinated cranberries, drizzle of creme anglaise and caramel sauce, and—Wait for it!—a dollop of sweet goat-cheese mousse. What an amazing flavour! The sweetened whipped cream is a perfect match for the goat cheese. A perfect end to the meal and a day on the road to visit Ottawa for Winterlude. Earlier, we mapped the cheesemakers in Ontario East and the cheesemakers in Ontario Southwest. Here are the cheesemakers located in Ontario’s Golden Horseshoe from Greater Toronto to Niagara. Click on “View Larger Map” for a legend showing the cheesemakers. Our mission at CheeseLover.ca is to publish maps of all regions, profiles of all cheesemakers and descriptions of the cheeses produced in a printed booklet and interactive website under the banner of Cheese Lover’s Guide to Ontario. As the six participants gathered around the kitchen of Urban Ashram, Tomas introduced us to raw milk and started us out by lightly skimming the cream off the top of the milk. 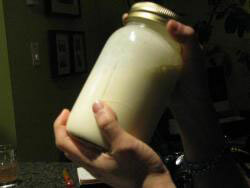 He then set us to churning in the simplest way possible: one takes a jar and one shakes the bejeezes out of it remarkably resulting in freshly churned unsalted butter and butter milk. Dairy demystified indeed. At this point I began to feel a little sheepish about my lack of knowledge of dairy products. He next demonstrated two different ways of creating cheese—one from simply adding vinegar to boiling milk and the other from adding rennet. After being drained, the vinegar batch resulted in soft, slightly salty cheese curds that could later be pressed into blocks to form panneer (the fresh cheese added to Indian dishes) or simply eaten as is. The batch produced from rennet, on the other hand, what was known as “hard cheese,” was suspended in a cheese cloth to drip to readiness. The excerpt comes from the Vancouver Observer which published the report by Cristina Peralejo yesterday. For the complete story, click here.